Automotive, Motorcycle, Cars, Setting, ECU, Engine, Machine. 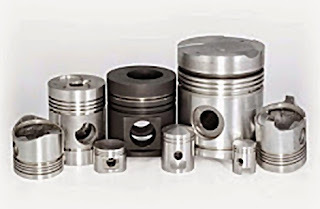 Functions and Ways of Working Pistons - The piston functions as a cross-section tool to withstand the pressure at the time of compression and power steps. Piston mesin 2 tak hanya mempunai 2 ring piston, yakni ring kompresi atas dan ring kompresi bawah. Piston 2 tak tidak mempunyai ring oli, karena pada mesin 2 tak Poros engkol, stang piston, piston dan komponen penggerak lainnya tidak terlumai engan oli mesin. Maka dari itu piston 2 tak tidak ring oli. Dengan oli samping lah komponen piston dilumasi. Dan pada badan piston 2 tak biasanya ada yang biasa polos dan ada juga yang bolong - bolong. The 4 stroke engine piston generally has 3 piston rings, namely the upper compression ring, lower compression ring, and oil ring. Unlike the 2 stroke engine piston that has 2 piston rings. Because the 4 stroke engine the piston drive component is lubricated with oil. On the surface or shield of the piston there is usually a flat, tilted or concave function the same as a combustion chamber. Now that's the explanation from me regarding the Function and How the Piston Works. Hopefully this tutorial can be useful for all of you. Don't forget to visit Eri Automotive to get other automotive science. If there are words that don't understand or there is little input from you, just comment on the comments below the post. 0 Response to "Functions and Ways of Working Pistons"